The developer of the proposed Don Sahong Dam on the Mekong River in Laos has based the project’s environment impact assessment (EIA) on “flawed and incomplete research” and failed to consult communities that would be affected by it, the World Wide Fund for Nature (WWF) said Tuesday. The Mekong River’s fish stocks and about 60 million people living in the Lower Mekong basin will be put at risk if the project moves ahead based on the current EIA conducted by Malaysian developer Mega First Berhad, the conservation group said. It called for a suspension of the 260-megawatt project, which Laos has said it plans to build in September, despite objections from neighbors Thailand, Cambodia, and Vietnam that not enough study has been done on its downstream impact. “WWF's review, conducted by international fish passage experts, finds the EIA riddled with problems such as inappropriate research methods, contradictory or lack of evidence and making recommendations on mitigation that have not been proven to work,” the report said. Chhith Sam Ath, country director for the WWF in Cambodia, said that the EIA needs to be carried out “objectively and scientifically” in order to fully understand the risks to people, natural resources, and wildlife in the Lower Mekong. The WWF said that the EIA had not made the case that the dam would not block transboundary fish migration routes, permanently harm fisheries, impoverish fishing families and hasten the extinction of the river’s unique wildlife. It added that the assessment did not demonstrate that impacts including fragmentation of the river system or the loss of fish routes and catch, nutrition and food security, livelihood, ecotourism, or agricultural production would be identified and mitigated. 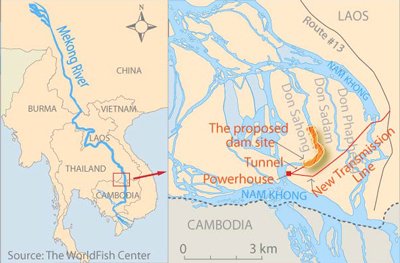 If built, the Don Sahong, which is to be located slightly more than 1 kilometer (0.75 mile) from the Lao-Cambodia border, will block the Hou Sahong channel—the only year-round channel for transboundary fish migration on the Mekong. WWF said blocking the channel would cause “permanent damage” to the Mekong basin’s fishery resources, which it valued at between U.S. $1.4 billion and $3.9 billion per year. According to design guidance by the Mekong River Commission (MRC), an intergovernmental body which monitors development on the waterway, hydropower projects must ensure that 95 percent of target fish species can pass through the dam’s fish passage, WWF said. “The EIA has not demonstrated with any evidence that the dam can achieve this requirement,” it said, adding that even in the event that a maximum of 5 percent reduction was maintained, it would still represent significant losses to the Mekong fishery economy. Chhith Sam Ath said that there was no scientific evidence in the EIA to support claims that the Don Sahong will not have a significant impact on fisheries. WWF said that the assessment also failed to acknowledge numerous water flow and level impacts that would result from the construction of the Don Sahong. “The authors of the EIA have not adequately considered or documented these changes, including how they might impact on fish and fisheries, especially migrations of particular species of fish up different channels,” it said. “In the event that the proposed mitigation measures do not work, there is no alternative plan or failsafe,” it said. Chhith Sam Ath told RFA’s Khmer Service that the dam’s construction would “seriously impact” Cambodia because of its proximity to the dam site, demanding that an EIA be carried out there according to international standards in addition to the one in Laos. “So far we have only seen studies conducted on the Lao side,” he said. He urged the Lao government to hold talks with the Cambodian government and villagers who could be affected by the dam. “This must be discussed with villagers who are living downstream from the dam—[Mega First] must accept the villagers’ concerns,” he said. His recommendation echoed concerns by Cambodian officials over the dam, including from secretary general of the Cambodian National Mekong Committee Te Navuth, who The Phnom Penh Post quoted Tuesday as saying that further studies were needed on the dam’s downstream impact. 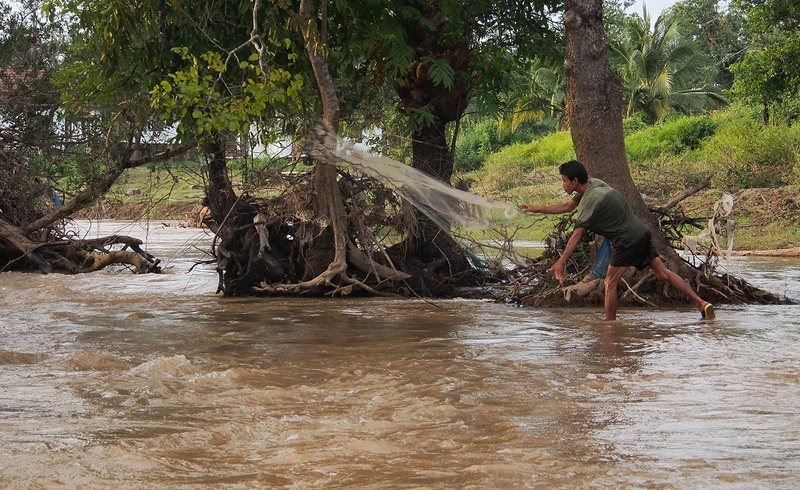 “The project documents lack of information and certainty on the proposed fish migration mitigation measures during the dry season and lack trans-boundary assessment on ... the downstream impacts,” Te Navuth told The Post. It said all additional studies should include transparent consultation with governments, civil society, and communities that would be affected by the proposed dam.